Broad-ranging historical review, integrative, inspirational, and visionary. Thoughtfully demonstrates the value of appropriate visualizations in understanding patterns, exploring knowledge sources, and discovering important trends in science. 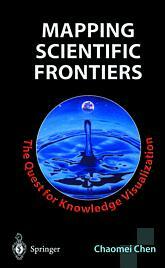 Mapping Scientific Frontiers examines the history and the latest developments in the quest for knowledge visualization from an interdisciplinary perspective, ranging from theories of invisible colleges and competing paradigms, to practical applications of visualization techniques for capturing intellectual structures, and the rise and fall of scientific paradigms. Containing simple and easy to follow diagrams for modeling and visualization procedures, as well as detailed case studies and real world examples, this is a valuable reference source for researchers and practitioners, such as science policy analysts, funding agencies, consultancy firms, and higher education institutions. It presents 163 illustrations, 111 in colour, including maps, paintings, images, computer visualizations and animations.